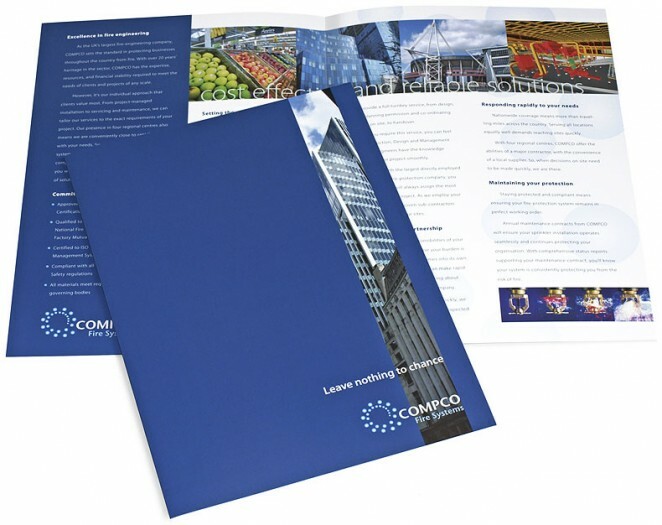 As part COMPCO’s marketing collateral, we produced a COMPCO company profile, which can either be used as a stand-alone document, or as part of a corporate presentation. Finished to just over A4 size, the profile has the capacity to hold a number of A4 company leaflets. For over 27 years, COMPCO has been at the forefront of protecting people and property from fire. As the UK’s largest independently owned fire-engineering company, COMPCO has the expertise, resources and stability to meet the needs of clients and projects of any scale. From a project-managed installation to servicing and maintenance, COMPCO will tailor their services to the exact requirements of a project. With a broad experience in all fire-protection technologies, COMPCO will make sure that the client will benefit from the most suitable solution for their needs. Working within many markets and from four regional centres, COMPCO offers the ability and expertise of a major contractor, with the convenience of a local supplier.